A few weeks ago, the folks at Kiehl's offered to send me their brand new moisturizer -- so new, in fact, that it hadn't even hit shelves yet. The product, you may be wondering? 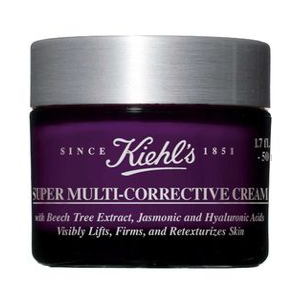 It's Kiehl's Super Multi-Corrective Cream. I've been using this moisturizer faithfully every night for the past three weeks. My skin reacted very well to it immediately -- any hint of dryness and dehydration vanished practically overnight, and I never experienced any breakouts or clogged pores. The formula is a bit thick and greasy, so you really don't need much -- just a dime-sized amount is more than enough for your entire face. This moisturizer has definitely found a place in my regular skincare regimen. Any product that makes me look almost 20 years younger isn't going anywhere! Kiehl's Super Multi-Corrective Cream retails for $62 at kiehls.com. I have both in small quantities and have definitely noticed a difference. I was applying more of the cream specifically to my dark spots and they've faded slightly in the past few weeks!